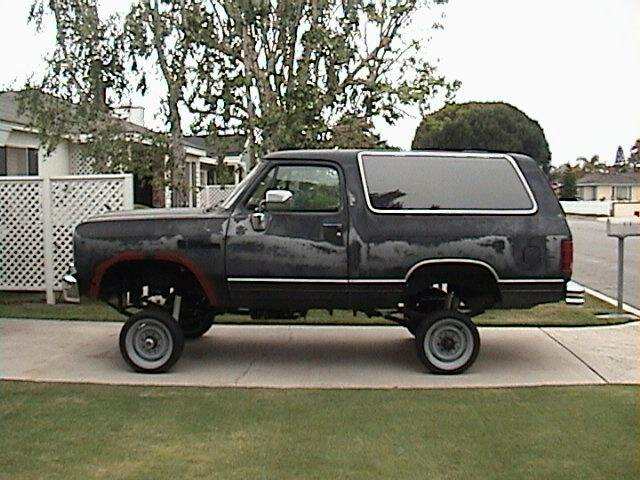 You can buy 16" wheels that will fit that truck but I don't see the reason to do that. You can get a better combination by using the correct size wheels and tires in 15". Looks like aftermarket wheels are here to stay guys .Wether we approve or not . With the proper offset and back spacing , a low ,width to height ratio tire and just a 1" increase in rim dia can actualy impove some parameters. As long as they stay away from the stuff like the 27" WAGON WHEELS. Retired is right. Some people are going for the looks and not worried about functionality. Even if it is unsafe. Yesterday I was working on a 94 Dodge W150 and the customer had some 16 inch wide aluminium rims with tires that had the sidewalls bulging out. The lug studs weren't even sticking out that far from the rim holes. You could maybe get maybe 4 threads into the lug nuts after they were tightened. That pic is PRICELESS "DS"
If you go for 16 inch rims, I doubt that you will get 85s on without a body lift. Might even struggle with 75s. My original thought was to put 16 inch rims on, but stayed with 15s largely because of cost, but also the dicking around with speedo etc.